When a lychee tree flowers the flower panicle emerges 4-6 weeks after initiation has taken place as a showy multi flowered cluster, known as a panicle, on the end of branches (terminal inflorescence). In Florida, flower buds emerge in December and sometimes as early as November. The buds develop into a panicle during December and January. The flowers which are borne on these panicles develop from February through March. Fruit resulting from trees which flower very late in the cycle often to not fully mature. A fully developed panicle consists of a main stem or spine known as a rachis with lateral (axial) branche. These branches are covered with one or more spikelets each having three small greenish yellow non-fragrant flowers approximately 2 to 3 mm in length. Lychee flowers do not have petals, but they do possess the typical anatomical components of a flower: ovary, style, stigma anthers. A panicle can be 1 to 1 ½ feet in length or more long and have as many as 3000 flowers, although only a small percentage of these are ever pollinated (100 - 200). An example of a flower panicle is shown in Figure 1c. 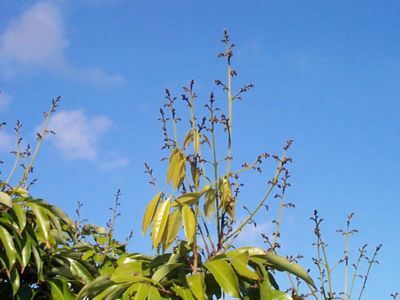 The earlier in the winter a lychee tree flowers the more time the panicle has to elongate and develop and the more fruit the panicle can potentially produce.